January of 1973 was the end of the Smithsonian Agreement and Switzerland started to float the Franc. On October 19, 1973 an oil embargo was placed on the United States by Arab members of OPEC in retaliation to the U.S. government's support of Israel during the Yom Kippur War. The embargo would last till March of 1974, but not before causing one of the worst energy crisis in the history of the developed world. Oil prices TRIPLED in a few months. Arab oil revenues exploded - much of which was spent on GOLD, inspiring a 50% rise in gold from October to March. The current gold correction and the geopolitical situation in the Middle East remind me of the October 1973 Oil Embargo, when gold went from approximately a $60 low in 1973 to $190 new all-time high in March 1974, breaking the 1973 high of $135. The news then was Arab wars, currency wars, oil and gold. Today we have the same and it's even worse, we have sanctions on Russia, BRICS collaborating against USD reserve status and Saudi Arabia is pissed that the US is supporting Israel again. If history is any guide then gold will break the 2011 high of $1,925 and rise to $2,695 or 40% above the previous high just like in 1973-74. So assuming that some type of "Black Swan" occurs before the end of 2014 (maybe it has already occurred?) we could see gold skyrocket to new ALL-TIME highs by April 2015. If we don't get a "Black Swan" this year then maybe in 2015 and a new high in 2016? Either way gold is going to break the 2011 high within the next few years. It would not surprise me at all to see gold go straight up to $2,600 before the summer of 2015. 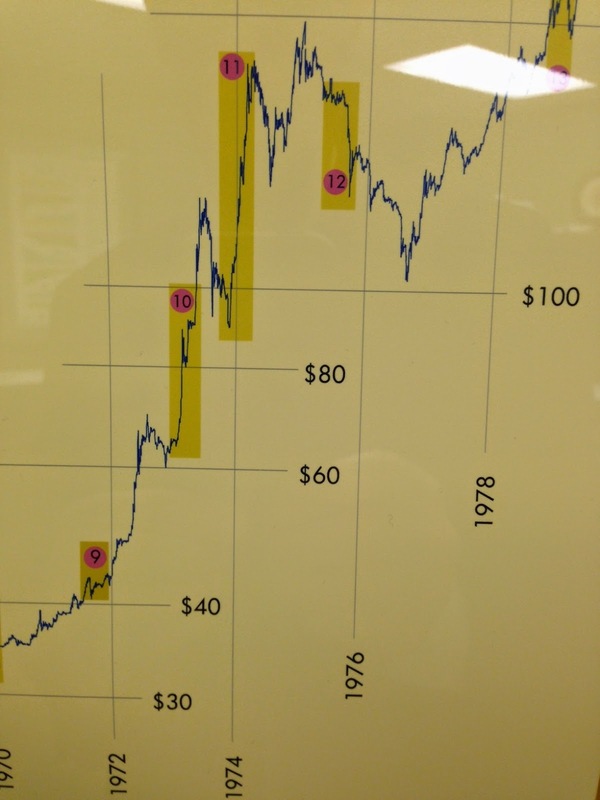 This chart is from the "History of Gold" picture in my office. Gold trades at 1,194 $/oz this morning and has hence breached the important support level at 1,200 $/oz. The lowest price was briefly “reached” with 1,183 $/oz in Asian trading hours. Gold’s slide therefore continued from September into October after the metal Gold had closed the previous month already with a loss of 6%. The looming rate increase in the USA hovers unchangedly over the precious metal. The again positive labour data (non-farm payrolls) led to strong sales and fresh short positions on Friday and let gold fall below the level at which it had started into the year. The development in the USD could not be more different: Not only against the Euro, the currency trades at a 4-year peak and impairs gold’s chances of a turnaround. However, it also means that the price in Euro had – until Friday’s correction - developed positively in the past two weeks. In this market environment the stocks of the largest gold-backed ETF, SPDR Gold Trust, also fell to its lowest since December 2008 (769 tonnes). The highest level was reached in 2012 with 1,353 tonnes. Speculative investors continue preferring to participate in the more promising stock markets. Sentiment appears different among physical investors according to the sales figures released by the US Mint: September saw the highest number of Gold Eagles coins (1oz) sold since January. Due to the lack of demand out of China in the course of the National Day holidays, support out of Asia will continue to stay weak until mid-week. It is important now that gold does not fall below 1,180 $/oz, the low from June 2013. Silver continued to move within its downward trend channel and closed another 60 USD cents lower last week at 16.80 USD/oz. Also, compared to gold, silver devalued with a gold-silver ratio already above 70 now. Reasons for this decline continue to be found in robust US economic numbers and a consequently stronger USD. On the chart there is now room down to 15 USD/oz while 18 USD/oz should cap any upward movement. However, speculative short-positioning reside on record highs leaving some potential for rapid short-term upward correction. Regarding economic data releases this week, in particular jobless claims on Thursday and Chinese PMI on Wednesday may give impulses for price movement. Furthermore, Industrial Production from Europe will be released. Analogously to Gold the other precious metals came under pressure during the reporting period. Thus also platinum continued its downward movement. While gold “reached” a 15-month low this morning, platinum dropped to its lowest value in 5 years with 1,183 $/oz. Platinum was hence unable to escape gold’s drag and only trades at a premium of barely 10$/oz to gold. Even if disruptions in production in the first half year were on a very high level the recent price developments speak for sufficient amounts of above-ground stock to serve the current market needs. It is safe to say that it will take a while until those stocks are fully depleted and result in price increases. Since the beginning of the year until the end of August palladium had been performing extremely well and had reached with 900 $/oz the highest price level in 13 years. Yet since September the direction has changed and the metal continues its slide: Palladium has declined by 15% since it traded at its peak level. Palladium had started at 776 $/oz into the reporting period and closed again lower at 753 $/oz as net-long positions continue to be reduced. We see support at 692.50 $/oz – this year’s low. On lower levels industrial demand tend to picks up again. This could explain the slight premium increase for palladium sponge. While demand for cars in the US in September was below expectation, it showed nevertheless a 6% increase (YoY) and shows the generally more positive sentiment in this segment. Especially the US automotive industry represents an important market for the metal due to the catalysts needed for its petrol driven cars.